Chapter nine of John’s Gospel tells about the man born blind. 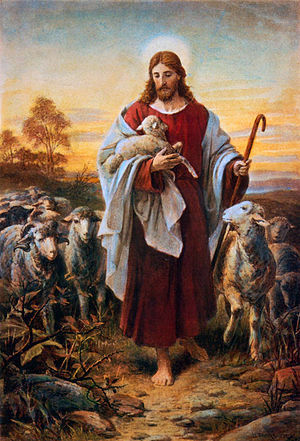 Then in the following one is the lesson of the Good Shepherd. And I dare say it seems at first as if there were no link between the two. But if it is hard for us to find a link, it was all plain as daylight to the man born blind. He hid in the crowd and drank in every word that Jesus said; and as he heard that wonderful talk about the shepherd, he said to himself, “Every syllable of that is meant for me.” Had not the Pharisees excommunicated him? Had they not slammed the door of blessing in his face? “I am the door,” says the Lord Jesus. Had not the Pharisees been mad with rage that he, a poor lost sheep, should dare to teach them, the shepherds of the people? “I am the good shepherd,” said Jesus. Christ knew what had happened. He knew the treatment His beggar-friend had gotten. It stirred His heart into this noble eloquence. And as the sunflower springs from its seed, so all the wealth and beauty of our chapter spring from the healing of the man born blind. Of course, when Jesus calls Himself a shepherd, He is far from being first to use that figure. The originality of Jesus does not lie in saying things that were never said before. Old Homer (whom I hope many of my readers love) is fond of calling his heroes shepherds of men. It had been used of Cyrus in Isaiah; of rulers and prophets in Jeremiah and Ezekiel. It is the name given to the teacher of wisdom in Ecclesiastes. It comes to full bloom in the twenty-third Psalm. I wonder, too, if you have ever thought how many of God’s great leaders had been shepherds. Abraham and Jacob both had to do with sheep. Moses was keeping Jethro’s flock when God spake in the burning bush. When Samuel came to seek a king, the king, a ruddy lad, was shepherding. Amos the prophet was a simple herdsman. And Jeremiah, the prophet most similar to the Lord, would seem to have been a shepherd too. Did not Christ know all that? Had He not brooded deep upon these shepherds, as He wandered among the hills of Nazareth? Now, at the touch of need and under the impulse of a great compassion, He glorifies and crowns that ancient image by making it the express image of Himself. Note once again that the sheep know their shepherd. There is a story of a Scottish traveler in Palestine who thought he would try an experiment upon the sheep. He had been reading this chapter of St. John, and he was eager to put it to the test. So he got a shepherd to change clothes with him; and the tourist wrapped himself in the shepherd’s mantle, and the shepherd donned the tourist’s garb, and then both called to the flock of sheep to follow (in the East the shepherd goes before his flock). And the sheep followed the voice and not the dress. It was the voice and not the dress they knew. So you see that every sheep in the flock has got an earmark—it can tell the voice of the shepherd from a stranger’s. And every sheep in the flock has got a foot mark—they follow the shepherd because they know his voice. Have you been branded on the ear and foot? Are these two marks of ownership on you? Samuel was but a child when he cried out, “Speak, Lord, for thy servant heareth!” The Shepherd called him and he heard the voice. His life for the sheep. Learn, then, that the cross is Jesus’ noblest deed. It is not an accident; it is an act. It is the crowning service of the Shepherd to the sheep, whom He loves too deeply ever to let them go. Inspiring leadership is defined by an inspiring attitude. Inspiring words and acts are preceded by an inspiring attitude. Like it or not, our thoughts and interpretations of people and circumstances directly influence our beliefs, and ultimately, our leadership actions. Yes, bad things do happen and they sometimes “just show up.” Any leader would be hard pressed to remember a week when no curve balls were thrown at him or her. However, it is our interpretation that makes a situation negative. A surprise event or a challenging moment doesn’t have to drag us down. The way we choose to think about what happens determines the ultimate outcome. Henry Ford once said, “Whether you think you can or cannot, you’re right.” In other words, your attitude reflects your past, describes your present and predicts your future. Our experiences are much less important than our attitude toward them. Our interpretations of experiences either limit or enable our future success. Here’s an example: A mission-critical project you are leading has “promotion” written all over it, but it bombs – it’s over budget, past its deadline … the works. How you choose to interpret those facts is how you shape your future. Do you see yourself as a failure, a poor leader who is maxed out and on the way out? Or are you a great leader in the making who is learning some tough lessons that will help ensure success on the next project? You think the best because you have seen the benefit of doing so. We must manage our attitude as carefully as we manage our money. At any moment during daily leadership, we can fall victim to our own attitude. Self-doubt and fear are the enemies of inspired leadership. Instead, choose an attitude of victory and your team’s performance will follow. 1. What does my attitude today say about the results I can expect tomorrow? 2. How does my attitude toward my own capabilities, my team and my goals affect my leadership?